From our neighbors waaaay up north in Canada, we found a University of British Columbia study of “Bicyclists’ Injuries and the Cycling Environment” which examined the risk of injury associated with cycle routes. Published in the American Journal of Public Health, the study quantifies the intuitive belief that bike riders are safest away from other traffic. 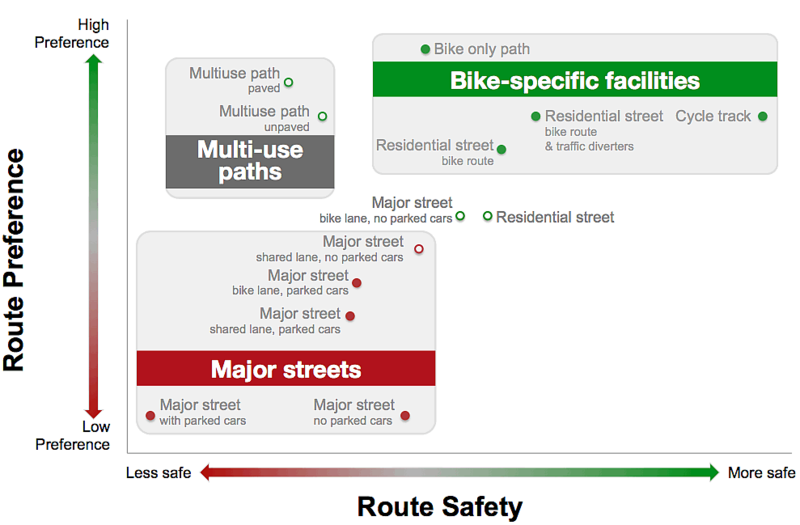 The highest risk route was major streets with parked cars and no bike infrastructure. This diagram shows as bike infrastructure is separated from vehicular traffic, the risk of injury decreases, while the appeal of the route to cyclists increases. Now a cycle track running the length of the county down the coast would be great, but we think we have a less costly approach which has most of the benefits, without the associated high cost of construction and ongoing maintenance. 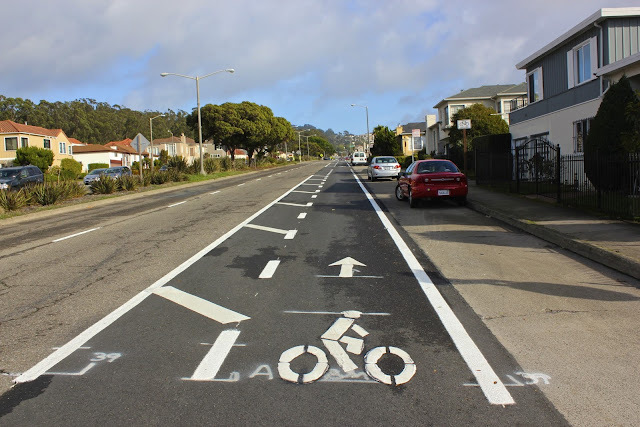 Buffered bike lanes could be implemented fairly quickly if some localities are willing to find some space for cars to park other than the roadway. They also could be incorporated into the design of the new developments in construction and in the planning phases throughout the county. Seal, Sunset, and Huntington Beach are likely candidates as are Newport and Laguna Beach for the coastal portion of our BikeBone. Coupled with roundabouts (and mini-roundabouts) at targeted intersections, driving and riding up and down the Coast Highway would become much safer for people on the roadway as well as pedestrians trying to cross it. Trimming travel lanes from 12 to 10 foot widths to accommodate additional buffer space would also induce traffic calming and reduce vehicle collisions as well. 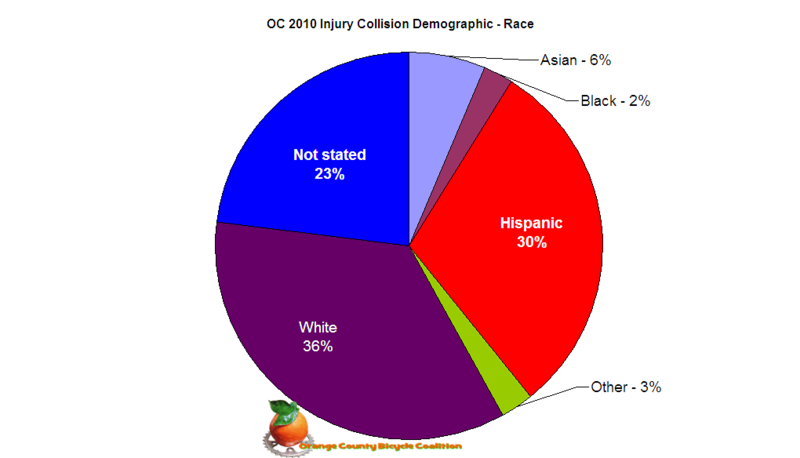 With a little paint and reclaimed space, Orange County could (and should) transform a high death / high injury roadway into a much safer and saner travel experience. The approach used above provides some measure of safety for riders going uphill by providing them space out of the traffic lane, while riders descending have sharrows to guide their way clear of the door zone in Santa Monica on Arizona Avenue. The approach below shows the buffer of a buffered bike lane placed in the “door zone”. 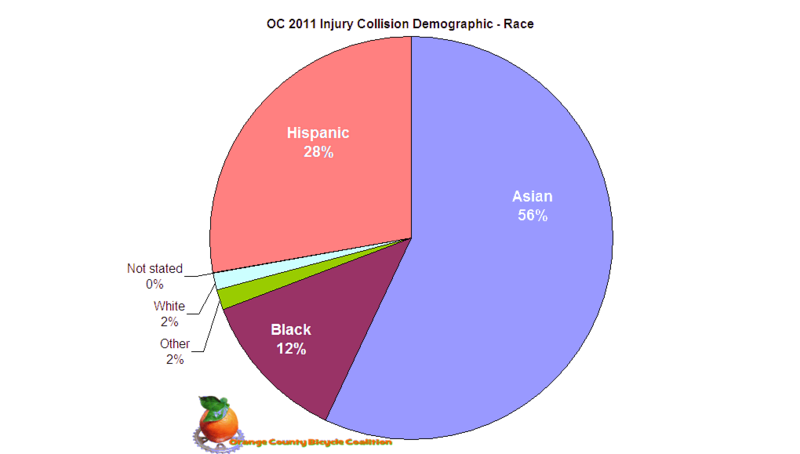 Being 2nd in the state (behind Los Angeles) for cyclist injury and death is not something to be proud of, nor something that should be accepted as “coming with the territory”. As seen in the above two pictures, Los Angeles County is applying low cost (paint) methods (a variety of appropriate designs) to improve both the connectivity of bike-able streets, and the safety of its riding public. 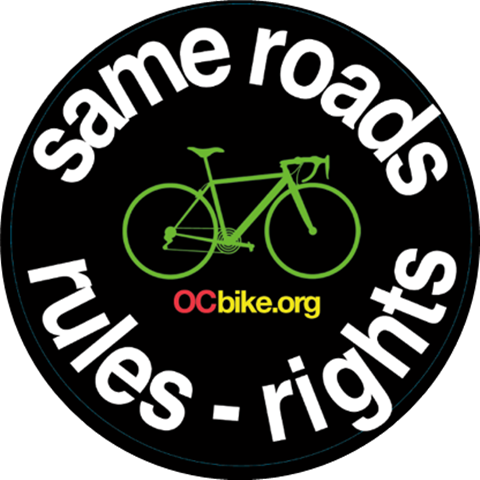 Despite numerous projects to increase vehicular traffic flow, scant attention seems to be made in this county regarding safer infrastructure for the riding public; the latest affront being the temporary loss of the northbound cycle lane on PCH before Warner without any advance notice or warning to advocacy groups. 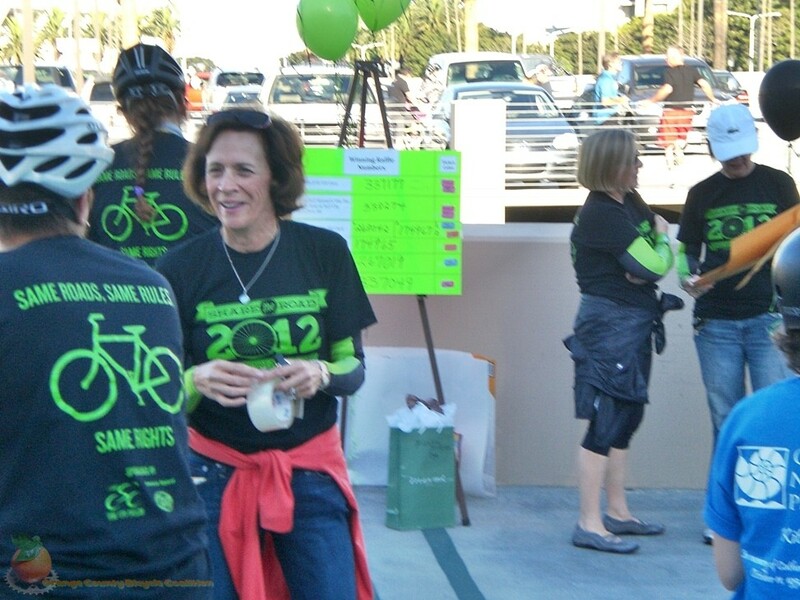 It “only” took over two years, two deaths, a threat of (yet another) lawsuit, and the turnout of hundreds to catch the attention of one city to take action in the form of putting some paint on the road to improve cyclist safety. Given the number of riders observed preferring the door zone to the clear direction provided by the recently installed sharrows, we provide the instructive graphic on the left. Sharrows are positioned on the road to provide guidance to bike riders as to where to position their bikes as they make their way down the road. Two rules apply:1) ride with the direction of traffic, (2) ride between the stencil’s wheels and through the center of the chevrons. As the county continues developing its last open spaces creating greater demand on the roadways, proactive planning for active means of transport should take the forefront, and not be an afterthought after the last strip of pavement is laid. As the study points out, infrastructure plays a key role in attracting and motivating more people to cycle, in addition to increasing their safety while doing so. As we continue collecting your input on our Bike Commute Survey, it’s clear a dedicated cycle route free from non-cycling entities is highly desired. 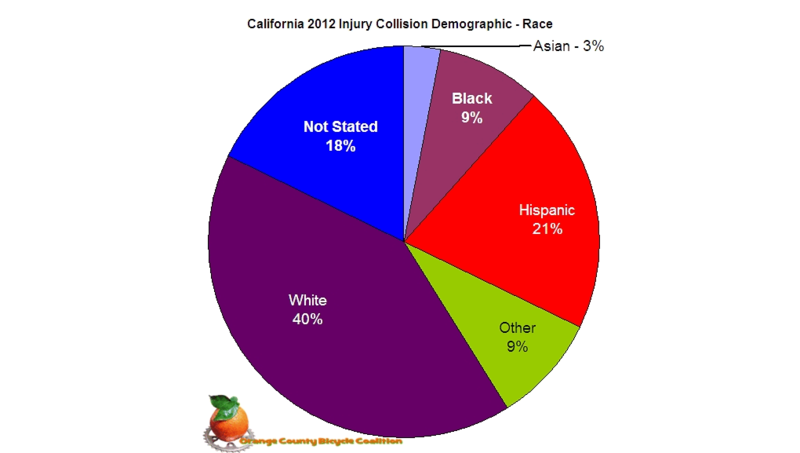 Using the study’s observations and conclusions, City, County, and Caltrans planners can design safer means of roadway treatments to accommodate all users of the roadway regardless of how many wheels those users may have under them. It’s ON in Newport – Thanks OC! Late word is that the police quit counting at 1,200 riders – AWESOME! 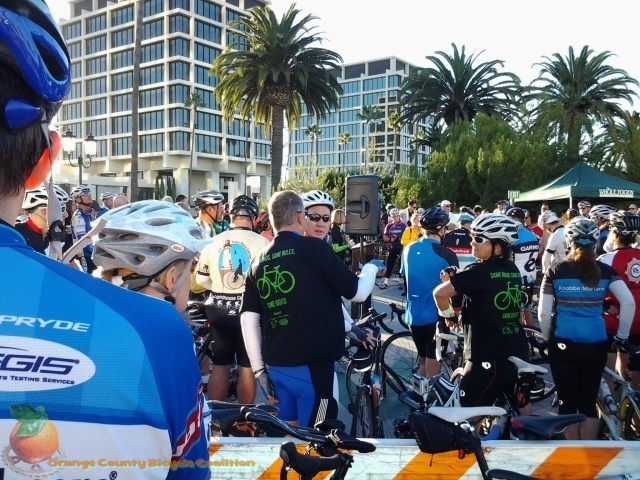 Thanks to all who signed up and are riding this morning! If you’re not signed up – show up anyway and join the 52 mile “unofficial ride”. 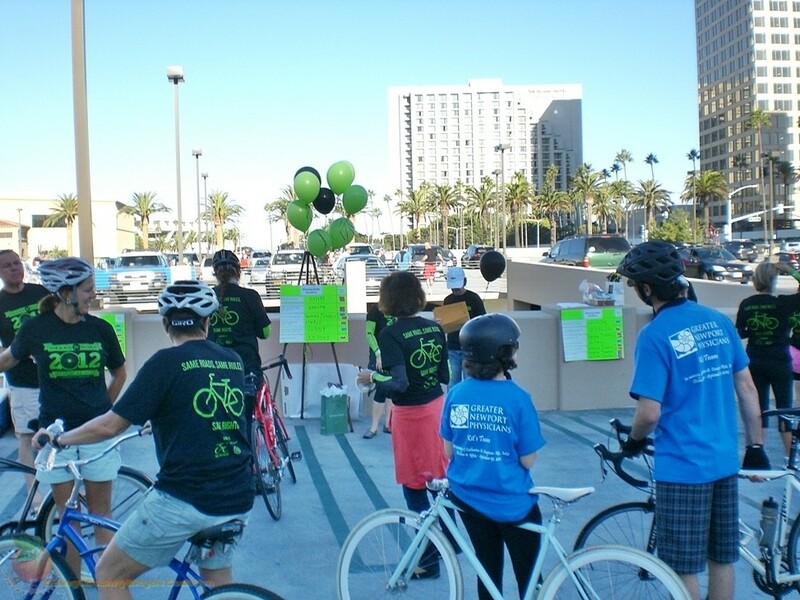 With over 600 signed up, meet your new best friends on two wheels for a coastal tour of Newport,Huntington Beach, and Long Beach. Ride respectfully and safely, and have a great time!